The symptoms of prolonged physical, emotional or psychological stress and the associated restrictive behavioral patterns in relationships impair the healthy self-regulating forces of our body and psyche. In order to deal adequately with the consequences and to support people in their healing process, we need to be familiar with how the nervous system works, we need compassion and practice. Gentle, body- and relational-oriented approaches have proven to be particularly effective in restoring and expanding our capacity for regulation and resilience. We will learn about a developmental model of the brain and social nervous system and various ways to regulate it. 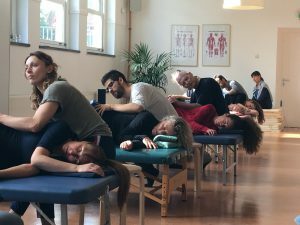 An attuned and supportive touch proves to be particularly effective in order to develop physiological and emotional capacity for self regulation of internal states and a healthy body and self-image with adequate boundaries. By including movements in the touch work at the table, we are able to support clients in responding better to changes in their environment, to have an impact on them and deal with them. As practitioners you´ll learn to track and regulate your own body and emotional states better while working with clients. The contents and structure of the seminar are suitable for both bodyworkers and psychotherapists.